Figs are a really versatile fruit that work well as a dessert but are also delicious when eaten as a savory treat. In this recipe I find the sweetness of the figs is balanced perfectly with the saltiness of the prosciutto and the spiciness of the arugula. Unroll the puff pastry sheet onto the prepared baking sheet. Using a knife, lightly score a border around the pastry about ½ inch from the edge on all sides, taking care not to cut through the pastry. In a bowl, mix together the ricotta, egg, salt and pepper. Spread the mixture over the puff pastry, leaving the ½-inch border around the edges exposed. 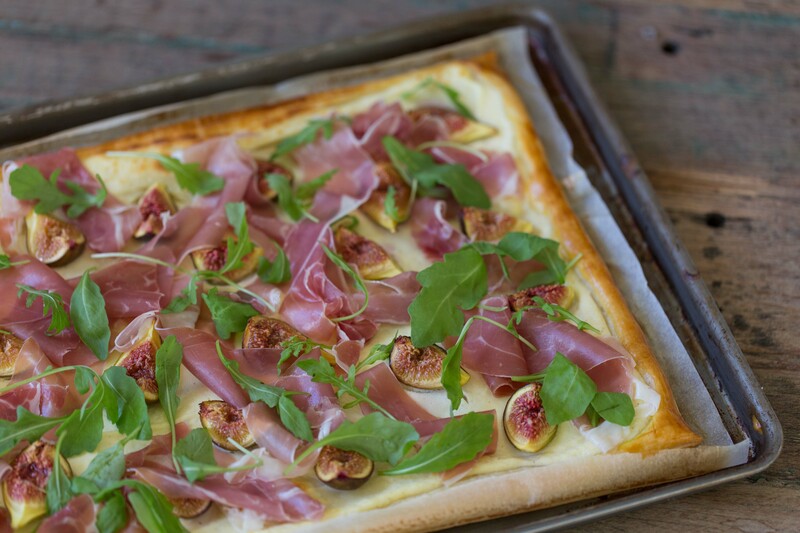 Arrange the pieces of fig overtop the ricotta and brush the border of puff pastry with the beaten egg yolk. Bake in the preheated oven for about 15 minutes or until the puff pastry is golden brown and cooked through and the ricotta mixture has set. Remove the tart from the oven and allow to cool for about 10 minutes. Top with the slices of prosciutto and arugula leaves. Serve immediately.